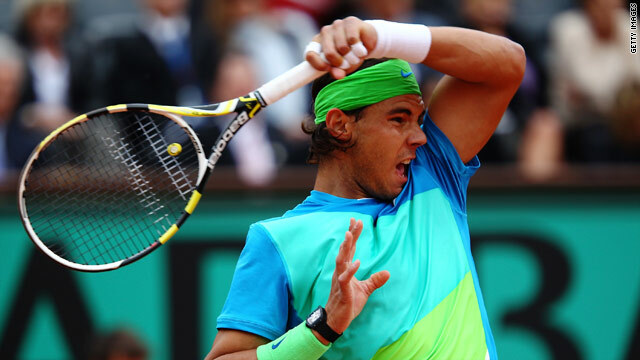 Rafael Nadal hooks a powerful forehand during his straight sets win over Lleyton Hewitt. (CNN) -- Rafael Nadal stepped up his bid for a fifth French Open crown with a straight sets win over former world number one Lleyton Hewitt in Paris on Saturday. Second seed Nadal was made to fight hard against a determined Hewitt, but wrapped up a 6-3 6-4 6-3 victory in two hours 28 minutes on the Philippe Chatrier court at Roland Garros. Nadal was often extended in cold and windy conditions but said he is running into his best form for the second week of the grand slam. "I am playing better now and today was a good test against Lleyton and to win against him in three sets is very good news," he said in a courtside interview. Hewitt made an immediate break of service against Nadal, but the Spaniard immediately retrieved it and a further break saw him take the opener. It was Hewitt's turn to hit back after the early loss of his service in the second but once again it was Nadal who pulled clear to take a two sets lead. The third set again followed the same pattern, with Hewitt having to hit back after an early loss of service before slipping to defeat on the third match point. Nadal will now play young Brazilian Thomaz Bellucci, who beats Croat veteran Ivan Lubicic 7-6 6-2 6-4, in the fourth round. Earlier, sixth seed Andy Roddick made a third round exit to Russian qualifier Teimuraz Gabashvili to continue his dismal run at Roland Garros. The big-serving American has never got beyond the last 16 in the clay court grand slam and was roundly beaten 6-4 6-2 6-2 by world number 114 Gabashvili. "I've fought through a couple of matches that were a bit dicey but today I got outplayed from the first ball," Roddick told AFP. "He played good tennis. Credit to him. He got the best of me and he was getting the best of me on 70 percent of the points." Gabashvili will now play Austrian Juergen Melzer, who shocked ninth seed David Ferrer, easing to a 6-4 6-0 7-6 win over the Spaniard, who had been favored to challenge in Paris. But 22nd seed Melzer was always on top and wrapped up victory in the third set tiebreak which he claimed seven points to one. Third seed Novak Djokovic booked his place in the second week with a relatively comfortable 6-3 3-6 6-3 6-2 win over Victor Hanescu, the 31st seed from Romania. The Serbian has a last 16 clash with American Robby Ginepri, who shocked Spanish 16th seed and 2003 champion Juan Carlos Ferrero, 7-5 6-3 3-6 2-6 6-4. Russia's Mikhail Youzhny, the 11th seed, will face French eighth seed Jo-Wilfried Tsonga in the fourth round after wrapping up a 2-6 7-6 6-2 6-3 win over Serbia's Viktor Troicki in a match held over from Friday.